Tilt the device to control the fish. Eat food to gain health. Avoid touching goo as it decreses health. Complete the objectives but beware of the shadowfish. New control options include 3 different setups for tilting the device and support for Sphero – an awesome ball robot you can use to control the fish. In each level you have to complete one of four objectives: survive for a specified amount of time; quickly follow a trail of rings; clear checkpoints; eat food with caution to reach a specific amount of health. Every level is different, be it food quantity, goo quantity, speed, size, movement patterns, health lost rate, number and speed of shadowfish. All these combined make each level unique. Survive as long as possible. Arcade starts with lots of food and some goo, but over time the food gets more rare and more goo appears. The fish also loses more health as time passes. Then appears the shadowfish. Survive, until the inevitable end. 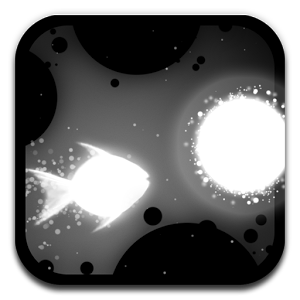 Last Fish is a stylish black and white action game about the survival of a tiny fish in toxic water filled with goo. Related Post "Last Fish Android v1.6.0 Apk Direct"